Available now in the United States. New Zealand, Australia, South Africa and India later in October. William Kamkwamba was born in Malawi, a country where magic ruled and modern science was mystery. It was also a land withered by drought and hunger, and a place where hope and opportunity were hard to find. But William had read about windmills in a book called Using Energy, and he dreamed of building one that would bring electricity and water to his village and change his life and the lives of those around him. His neighbors may have mocked him and called him misala--crazy--but William was determined to show them what a little grit and ingenuity could do. Yet William refused to let go of his dreams. With nothing more than a fistful of cornmeal in his stomach, a small pile of once-forgotten science textbooks, and an armory of curiosity and determination, he embarked on a daring plan to bring his family a set of luxuries that only two percent of Malawians could afford and what the West considers a necessity--electricity and running water. Using scrap metal, tractor parts, and bicycle halves, William forged a crude yet operable windmill, an unlikely contraption and small miracle that eventually powered four lights, complete with homemade switches and a circuit breaker made from nails and wire. A second machine turned a water pump that could battle the drought and famine that loomed with every season. 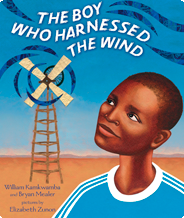 Soon, news of William's magetsi a mphepo--his "electric wind"--spread beyond the borders of his home, and the boy who was once called crazy became an inspiration to those around the world. 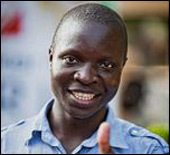 William Kamkwamba is a student at African Leadership Academy, a pan-African high school in Johannesburg, South Africa. A 2007 TED Global Fellow, Kamkwamba has been profiled in the Wall Street Journal and his inventions displayed at Chicago's Museum of Science and Industry. He's often invited to tell his story, and in 2008, he delivered an address at the World Economic Forum on Africa. Bryan Mealer is the author of All Things Must Fight to Live: Stories of War and Deliverance in Congo, which chronicled his experience covering the war in the Democratic Republic of Congo. Mealer is a former Associated Press staff correspondent and his work has appeared in several magazines, including Harper's and Esquire.